The Great New England Marijuana Accessories Swap Meet will be “like an Antique’s Roadshow for bongs.” According to Jeff Bianchine, director of the Holyoke Creative Arts Center, which will benefit from the fundraiser event, potentially hundreds of people swapping, selling, or purchasing marijuana accessories and two appraisers of marijuana accessories available to buyers or sellers. 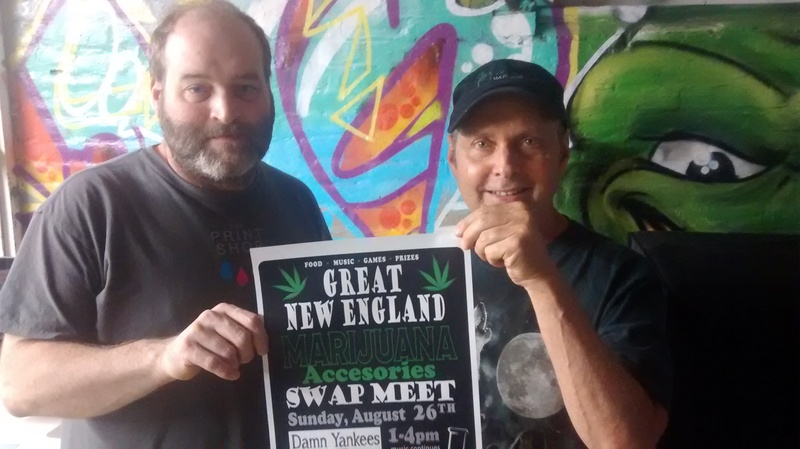 The bong swap is slated for Aug. 26 at Damn Yankees BBQ & Tavern (formerly the Waterfront Tavern) from 1 to 4 p.m. with local live music continuing until 7 p.m, and also featuring food, games, and prizes. Jeff Bianchine (left) and Mark Sherry (right) are organizing a bong swap on Aug. 26 to benefit the Holyoke Creative Arts Center. Mark Sherry, producer of the Valley Music Showcase, which highlights original songwriters and bands in the Pioneer Valley through a musical competition series at New City Brewery in Easthampton, said as far as he knows there’s never been a bong swap anywhere open to the public that aims to raise funds for the arts with marijuana legalized in Massachusetts. He said due to Massachusetts laws smoking on the premises and swapping or selling marijuana is prohibited. “This is a way to get people together who are cannabis friendly people and now that we have this new law that we’re legal to use marijuana in this state, it just seemed to me to be just a cool event to put together,” Sherry said. Sherry said he connected with Bianchine and the two organizations developed a partnership to make the event a fundraiser for the arts in Western Massachusetts. The Valley Music Showcase is also transitioning into becoming a nonprofit tentatively named The Western New England Music Alliance, which would foster local original music in western New England. Private sales of bongs and other marijuana accessories would be handled much like a tag sale, Sherry said.